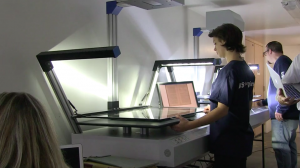 Vital records being digitally preserved. Improved state bond rating to save millions – Responsible management of precious tax dollars is key to putting the state back on a sound financial footing. The Ige administration’s long-term strategy of managing resources wisely led to the highest overall credit rating and positive outlook in the state’s bond sale history. This strong financial credit helps save taxpayers millions of dollars in future debt service payments and lowers the costs to finance public construction and repair projects such as schools and hospitals. Also, restructuring our payments for the health and pension funds for public workers will save more than $1 billion over the next 20 years. • Tax System Modernization (TSM) Project to improve efficiency – The first two phases of the new TSM project, one of my priorities, have resulted in greater transparency and accessibility for taxpayers through E-Services on the department’s website and improved services by adding a taxpayer advocate and other staff. • State going “paperless” to improve services – The Ige administration is moving state government into the 21st century by reducing paper, increasing efficiency and providing more public access. These efforts range from upgraded websites and e-Signing to modernizing the state’s paper-based payroll system and digitizing precious historical documents. Hawai‘i is leading the nation in modern electronic signature capability. In the State Archives, approximately 350,000 records are now accessible online, and departments such as DLNR’s State Bureau of Conveyances are digitizing 170 years of vital documents and land records. Read more in our January issue.